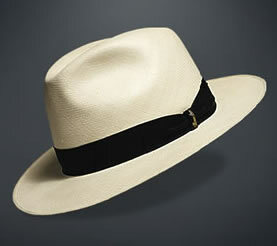 A Panama Hat, often know just as Panama, is a traditional brimmed hat from Ecuador which is made from the plaited leaves of the Toquilla Straw plant Carludovica palmata. Straw hats woven in Ecuador, like many goods from South America in the 19th and early 20th century, were shipped to the Isthmus of Panama first before sailing for their destinations across the globe. Some products got there name from the point of international sale rather than their place of origin, hence Panama Hats got their name from being sent out from Panama. The popularity of the Panama increased when American Football team, the San Francisco 49ers brought them back from Panama, and US President Theodore Roosevelt wore a Panama when he visited the construction of the Panama Canal. Panamas are also known as a Jipijapa after a town in Ecuador, a centres of the hat trade. The Oxford English Dictionary cites a use of the term as early as 1834. The Panama was glorified during the 19th century being considered the prince of straw hats. Ecuadorian national hero Eloy Alfaro helped finance his liberal revolution of Ecuador through the export of Panamas. The reputation of the Panama was further established by Edward VII, Napoleon III and various other aficionados. A 30 minute documentary about Panama Hats in three parts.